White blood cells, or leukocytes are so named because pus and the buffy coat are white. These spherical cells are the only formed elements with nuclei and other organelles. A healthy person’s WBC count is typically 4,500 to 10,000 per ul of blood. However, the number of a particular type of WBC increases whenever the body encounters pathogens (disease-causing organisms or chemicals) that it destroys. 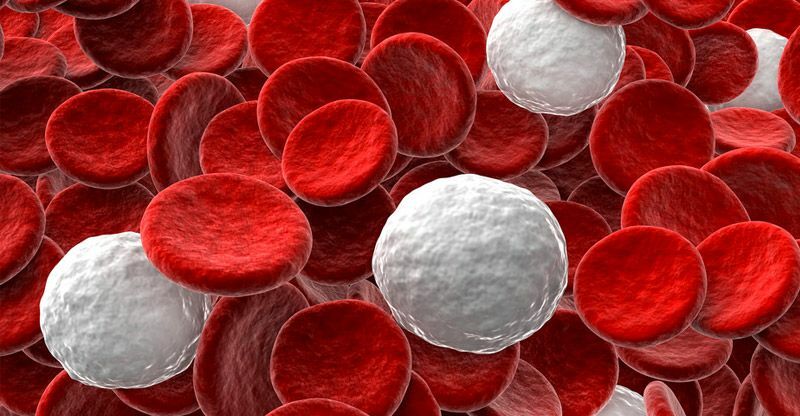 Like other formed elements, WBCs are derived from the hemocytoblasts in the red bone marrow and their lifespan ranges from a few hours to many years. Their production is regulated by chemical signals released by red bone marrow cells, WBCs, and lymphoid tissues. White blood cells help provide a defense against pathogens and certain cells either promote or decrease inflammatory responses. Most of the functions of WBCs are performed within tissues located external to blood vessels. WBCs have the ability to move through capillary walls into tissues in response to chemicals released by damaged tissues or pathogens. They are able to follow a “chemical trail” through the tissue spaces to reach the source of the chemical, a behavior called chemotaxis. WBCs move by ameboid movement, a motion characterized by flowing extensions of cytoplasm that pull the cell along. The congregated WBCs then work to destroy dead cells, pathogens, and foreign substances. Some WBCs destroy pathogens and cellular debris by phagocytosis. Others release chemicals that clump pathogens together, aiding phagocytosis, and still others release chemicals that kill pathogens. White blood cells may be distinguished from red blood cells by microscopic examination of fresh blood. However, WBCs must be stained in order to distinguish them from each other. The five types of WBCs are neutrophils, eosinophils, basophils, lymphocytes, and monocytes. WBCs are classified by the presence or absence of visible cytoplasmic granules when stained with Wright stain. Neutrophils, eosinophils, and basophils are collectively known as granulocytes (gran ‘-u-lo-sits), because their cytoplasms contain small, colored granules. Lymphocytes and monocytes lack visible granules and are therefore called agranulocytes. Granulocytes are about 1.5 times larger than RBCs, and are distinguished from each other by the shapes of their nuclei and the color of their cytoplasmic granules. Agranulocytes are distinguished from each other by cell size and nuclear shape. Lymphocytes are only slightly larger than RBCs, while monocytes are two to three times larger than RBCs. See table 11.1 and figure 11.5. Neutrophils are the most abundant white blood cells and form 40% to 60% of the total WBCs. They are distinguished by a nucleus with two to five lobes and inconspicuous lavender-staining granules. Neutrophils are attracted by chemicals released from damaged tissues and are the first WBCs to respond to tissue damage. They engulf bacteria and cellular debris by phagocytosis and release the enzyme lysozyme, which destroys some bacteria. The number of neutrophils increases dramatically in acute bacterial infections. Their primary function is to destroy bacteria. Eosinophils constitute 1% to 4% of the white blood cells. They are characterized by a bilobed nucleus and red-staining cytoplasmic granules. Eosinophils reduce inflammation by neutralizing histamine, a chemical released by basophils during allergic reactions. They also destroy parasitic worms and phagocytize antigen- antibody complexes. Basophils are the least numerous of the white blood cells, forming only 0.5% to 1% of the WBCs. They are characterized by a nucleus that is U-shaped or bilobed and by large, blue-staining cytoplasmic granules. They release histamine and heparin when tissues are damaged and in allergic reactions. Histamine promotes inflammation by dilating blood vessels to increase blood flow in affected areas and making blood vessels more permeable, which allows other WBCs to enter the affected tissues. Heparin inhibits clot formation. Lymphocytes form 20% to 40% of the circulating white blood cells. They are the smallest WBCs and are distinguished by a spherical nucleus that is enveloped by very little cytoplasm. Lymphocytes are especially abundant in lymphoid tissues and play a vital role in immunity, a defense mechanism that fights against specific antigens and builds a memory of these encounters. There are two types of lymphocytes. T lymphocytes directly attack and destroy pathogens (bacteria and viruses), and B lymphocytes develop into antibody-producing plasma cells in response to foreign antigens. Monocytes are the largest white blood cells, and they comprise 2% to 8% of the WBCs. A U-shaped or kidney-shaped nucleus and abundant cytoplasm distinguish monocytes. Monocytes are active in phagocytosis. The number of monocytes in the blood increases during viral infections and inflammation of tissues. Monocytes in body tissues are called macrophages. They are very active phagocytic cells that join with neutrophils to clean up damaged tissues and pathogens. They carry out their functions of engulfing dead cells, cellular debris, and bacteria only after migrating into body tissues.